Forget what you’ve heard- hair loss isn’t just for men. Believe it or not, over 40% of people who experience hair loss are women. Whether due to stress overload, hormones or genetics, women across the globe suffer from this condition for several reasons. Some women have hair that gradually thins all over, while others can get patches of bald spots at the crown of the head. Whatever the cause may be, it’s important to consult your physician to spot the culprit to effectively treat hair loss in women. Although this information might be a bit startling, the fact that this condition occurs in numerous women as well has led to the rise of effective hair loss treatments that can curb growth, repair damage and regrow hair. Many people are surprised to know that the average scalp has over 100,000 hairs. Your hair follicles produce a single hair that grows approximately half an inch per month. After about two to six years, the hair beings to enter a ‘resting phase,’ causing the hair to fall out and become thinner. The cycle then continues, helping to replace broken, damaged hair with new, strong strands. Since we have such a large amount of hairs on our head, it’s only natural that some of it comes out when performing daily tasks, like brushing your hair or catching on your clothing. However, if you begin to notice an extensive amount of hair loss that causes a dramatic shift in appearance on the scalp, you should begin to do your research on your symptoms. Although there are an exorbitant amount of possible causes of hair loss in women, a lot of them have to do with hormone changes such as menopause, thyroid conditions or genetics. Once the cause is addressed, most people’s hair grows back for a more even, thick head of hair. Menopause might seem frightening in theory, but it is a natural occurrence that happens in all women around the ages of 45 to 55. Hormones play a significant role in almost every part of our body, including hair, mood, water balance, blood pressure and growth development. Hormones act as messengers in the body that help tell our body what to do and when to do it to ensure maximum effectiveness of organ function. Hormones are a part of our respiratory, cardiovascular, nervous, digestive and immune system, just to name a few. When a woman goes through menopause, their hormones tend to be lower, which throws off many parts of the body until they adjust into a normal cycle. This can deeply affect a woman’s hair thickness and consistency. This is because your hormones are directly connected to the growth and shedding cycles of our hair in a very important way. An imbalance of hormones due to menopause can cause the hair to fall out in clumps due to the pressure on the adrenal glands. By keeping a balanced diet and exercise regimen, controlling stress levels and ensuring you don’t have any type of vitamin deficiency is of utmost importance when dealing with menopause and hair loss. When a woman gets pregnant, it is a known fact that her hair becomes unusually illustrious, vibrant and thick. However, one thing women don’t think about is the change in which your body goes through after you give birth. During pregnancy, the heightened levels of estrogen in the body give you a radiant complexion, stronger hair, and thicker nails. After you give birth, your estrogen levels decrease dramatically, which in turn, affects almost every aspect of your body. Some women begin to notice more hair in the shower’s drain or in their brush and begin to panic. Stop yourself there! Post-partum hair loss is something almost every woman will face after giving birth and added stress will only aggravate the issue. Most new mothers begin to notice their hormones return to normal levels a few months after giving birth, which helps hair health go back to its normal, healthy state about six to 12 months after having a child. Eating a balanced and nutritious diet that is dense in vegetables, proteins and fruits can help speed up the process and decrease recovery time. Nutrition plays a major role in hair health. What you eat directly affects all aspects of your body, but has a notable effect on the health of your hair. One of the best kept secrets to shiny, beautiful and thick hair is keeping a balanced diet that consists of protein and iron along with fruits and vegetables. Since the hair is comprised of protein, it’s important to make sure you are getting enough servings of it every day. Research shows that a vitamin deficiency of any kind can cause hair loss. Whether you have a depletion of Vitamin B, C, E, D or A, you must address the specific concern to solve your hair loss issues. Although supplements can be extremely effective, you can also incorporate new foods to sustain your body with these valuable nutrients. Some of the top healthy foods for hair growth and health are: fish and oysters, sweet potatoes, eggs, Greek yogurt, lentils and blueberries. Depending on your specific diet, the food choices used can vary. If you eat fish, salmon is one of the healthiest foods you can eat because it provides numerous benefits for the entire body, specifically the hair. Salmon in rich in protein and Vitamin D, both which work together for strong, healthy hair. Salmon also omega-3 fatty acids, which your body needs to grow hair. Since your scalp is made up of omega-3’s, it only makes sense that ingesting more of them can lead to ultimate scalp health. If you’re not a fan of this particular fish, you can get these valuable omega-3’s from other sources such as avocados, walnuts and pumpkin seeds. A lack of zinc can lead to hair loss, so that’s why it’s important to eat Oysters. Oysters help heal a dry and flaky scalp along with thinning hair because it delivers almost 5 times the amount of your daily value of zinc in a small three ounce serving. If you don’t like oysters, you can get a proper amount of zinc from beef and eggs. Eggs are a common morning favorite that is jam packed with nutritional benefits. The four main ingredients that eggs have are sulfur, iron, zinc and selenium, which work together to bring oxygen to the hair follicles. This helps result in stronger, longer, thicker hair that you can feel amazing in. Sweet potatoes are one of the most nourishing foods on the planet, with countless benefits ranging from muscle recovery to hair health. Sweet potatoes are known for being strong in antioxidants, predominantly beta carotene, which your body then converts to Vitamin A after being consumed. Healthy levels of Vitamin A will help with your overall body function as well as locking in moisture for the scalp. Lentils are also an incredible source for helping solve hair loss in women because they contain Biotin, which is known to grow hair at a rapid rate when consumed consistently. Other hair growth building blocks contain protein, iron and zinc, making beans a viable resource for thickening your locks. Dairy gets a bad rep. Although many believe that the added hormones in dairy products can be rather unhealthy, foods such as Greek yogurt can dramatically help with hair health. This is because Greek yogurt contains Vitamins B5 and Vitamin D, which help improve follicle health, making them stronger and able to hold hair in its place for longer periods of time. Make sure to get the low-fat option! Blueberries are known for their extremely beneficial antioxidant properties and are commonly referred to as a ‘super fruit.’ One main benefit of eating blueberries is the Vitamin C that is present in them. Vitamin C not only helps with immune function, but it also helps with scalp blood circulation by supporting the blood vessels surrounding it. If you are deficient in Vitamin C, hair breakage can be very common. All in all, your diet is the foundation for your hair health. Improve what you eat and the vitamins you consume to reveal incredibly healthy and strong hair. Stop what you’re doing and put down the flatiron and blow dryer! Overexposure to heat by using these tools has a direct connection to hair loss and breakage. If you’re having issues with thinning hair or hair loss in general, your over styling habits can be the culprit of your problem. However, if you are not someone who regularly uses heating tools on your hair, you can also suffer from hair loss if you are over brushing your hair, wearing tight hats, and chemically treating your tresses. Sometimes, we don’t realize how much we are actually damaging our hair and scalp by doing these simple things and it is necessary to carefully analyze your hair habits to fully bring back your locks to optimal health. Your hair shouldn’t be brushed more than once a day and using a wide-toothed comb is your best bet to minimize breakage and damaging your hair. Wearing hats that are too tight can have a negative effect on your hair line. The rim of the cap can put too much pressure on your hair follicles and lead them to become softer and break off. This also causes the blood and oxygen flow to decrease in this area. Make sure that your hair is not being tightly gripped together by a too-tight hat or headband. Another simple mistake that women can make when it comes to hair is using a bath towel to dry your hair. Using these towels on the head leads to friction and rubbing of the hair and the towel, which in turn causes more breakage on the scalp, which can lead to hair loss. Modifying these simple habits can dramatically improve the health of your hair. 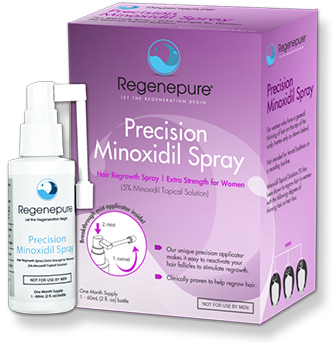 FOR WOMEN: Regenepure Precision 5% Minoxidil Spray is specially designed for women. The fine mist applicator ensures a clean and targeted application of minoxidil without any cleanup. SUPPORTS HAIR REGROWTH: The fine mist applicator ensures absolute accuracy, targeting problem areas with ease. The direct contact spray will also help provide the scalp with the oxygen and nutrients it needs to stimulate healthy regrowth. HOW IT WORKS: When applied once a day, minoxidil may support hair regrowth and promote thicker strands where there is thinning and weakness. WHAT YOU GET: Each box contains a one month supply of Precision 5% Minoxidil Spray in an easy to store 2 fluid ounce (60ml) container. THE REGENEPURE LINE: Regenepure Precision 5% Minoxidil Spray works best when used in conjunction with the Regenepure DR Hair Loss Shampoo, as the shampoo will help cleanse and detoxify hair follicles; allowing for optimal minoxidil absorption.